Below is a selection of the cars we currently have for sale. If we don't have the car you are after, please get in contact, as a large part of our business is satisfying our customers' desires. A stunning Swiss supplied 250SL, matching numbers, finished in Dark Blue with its original factory Pale Blue/Grey Leather. Automatic Gearbox with Power Steering and drives beautifully! A wonderful UK-Supplied 280SL, finished in its factory colour scheme of Silver with its original Black MB-Tex interior. Fitted with an automatic gearbox and power-assisted steering. An effortlessly pretty and very usable car! A very original 190SL presented beautifully in White with Grey Leather. This car has never been restored but benefits from a new paint and interior. A very rare find indeed! 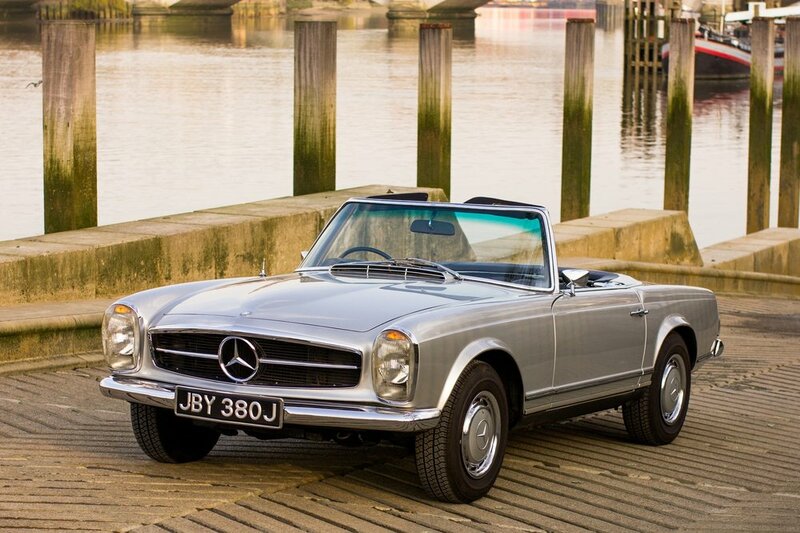 A stunning and very rare UK-Supplied Right Hand Drive 190SL, one of just 562 cars produced. Finished in its original colour scheme of Ivory with Red Leather. A stunning LHD UK Supplied 500SL in Blue/Black Metallic with Grey Leather. It has covered just 43,000 miles from new and is fitted with Air Conditioning, Heated Seats and many desirable options. A stunning fully optioned SL60 AMG, finished in Obsidian Black with black and grey leather and a black soft top. Fully optioned and one of just 49 RHD cars produced, this is exceptionally rare! A wonderful W124 estate finished in Polar White with Black Leather. It’s covered just 27,500 miles from new, with one effective owner. Fitted with Air conditioning and electric and orthopaedic seats. A wonderful early ‘G-Wagen’ finished in Cypress Green with Grey Sport Cloth. This car has the wonderful 280 petrol engine and a manual gearbox. It is in great original condition with just one owner for the first 31 years. 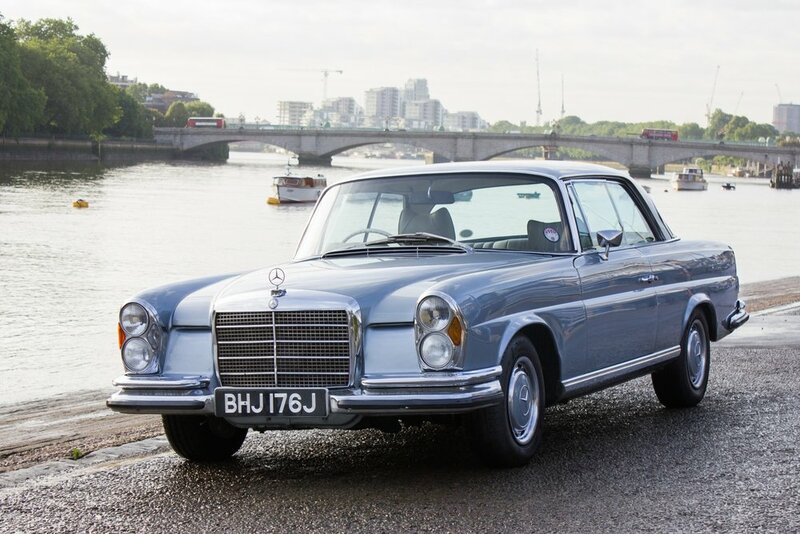 A wonderful 280SE 3.5 Coupe, one of just 245 UK-Supplied cars. Finished in Silver-Blue with Parchment Leather, floor-shift Automatic gearbox and electric windows. A flawless UK-Supplied RHD 250SL Pagoda, finished in Moss Green with Tan Leather. Fresh from a no expense spared cosmetic restoration. All original panels and just 64,000 miles. Absolutely stunning! A UK-Supplied RHD Car, finished in Silver with Blue Interior. Perfect specification of Automatic gearbox and power-steering. A great entry point into Pagoda ownership! A stunning 280SL Pagoda finished in Metallic Red with Tan Leather, and a black soft top. This car is is stunning condition throughout and has had just three owners who have covered just 44,000 miles! A wonderful 500SL finished in Anthracite with Grey Leather. This car has covered just 45,000 miles from new and is fitted with Air Conditioning and Heated Seats, and is in immaculate condition throughout!